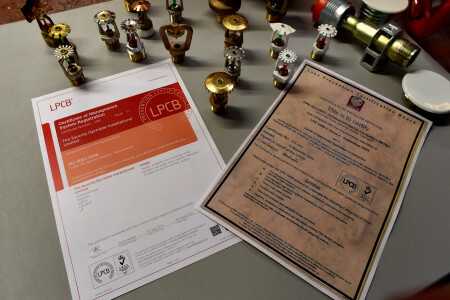 The LPCB are our industry regulators and they grant certification as third party confirmation that products, services, systems and personnel meet and continue to meet certain standards and specifications. The Redbooks, published annually by the Board, provide the authoritative guide to those companies whose operations, products and services achieve compliance with the quality assurance, product approval and certification schemes they operate. Fire Security is certified to design and install automatic sprinkler systems in line with Loss Prevention Standard (LPS) 1048-1, their highest approval level, for all types of sprinkler system and all hazard classifications. All UK insurance companies and specifiers require compliance with this standard. As a Level 4 Approved Sprinkler Contractor, one of only a handful of sprinkler contractors, we are able to self-certify our own designs meaning a reduction in design turnaround times and costs for our clients. Our management procedures are certified to ISO 9001 standards by our regulators the Loss Prevention Certification Board (LPCB). With an ISO 9001 Quality System in place you be assured that we keep up to date not just with today’s high standards and requirements, but those likely to have an impact on you in the near future. Fire Security are founder members of BAFSA, the UK’s trade association for the fire sprinkler industry. BAFSA is a trusted authority on the benefits and importance of fire sprinklers in all environments where they can be deployed. Our automatic sprinkler systems designs adhere to FM Global standards. FM Global offers worldwide industrial and commercial product certification and testing services through FM Approvals ®. Recognised and respected across the globe, FM Approvals certification assures customers a product or service that has been objectively tested and conforms to the highest national and international standards. Fire Security can provide Certificates of Conformity for systems conforming to Loss Prevention Certification Board rules incorporating BS EN: 12845. Fire Security were awarded the title of “Best Sprinkler System Installation Company- UK” in Build Magazine’s 2017 Facilities Management Awards.